THERE ARE MANY KINDS OF injectable fillers for facial augmentation or rejuvenation: hyaluronic acid, collagen, PRP or PCL. 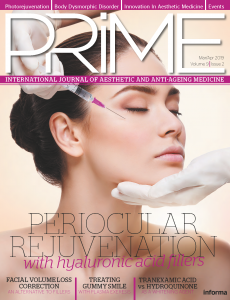 Among them, hyaluronic acid fillers have been leading the market for many years. Hyaluronic acid has many advantages over other materials, such as higher biocompatibility. Hyaluronic acid is not only widely distributed in our body but also has no species specificity. Therefore, there are fewer immune-related side-effects compared to other dermal fillers1. There are two types of hyaluronic acid dermal fillers in the market: monophasic and biphasic. However, this classification terminology is not scientific, but from the market. So we have to define the types of fillers by their physicochemical properties, these include the hyaluronic acid concentration of the final product, modification degree, and cross-linking ratio and etc. Each hyaluronic acid filler brand has its own characteristics to describe the advantages or differentiate it from its competitors. From the hyaluronic acid powder to the hands of a doctor, what makes the difference in hyaluronic acid fillers? The answer is manufacturing technology. Every company has its own manufacturing technology and some of them have already been published by patents or articles. A common manufacturing process includes the following steps: mixing (including concentrating the raw materials), reaction (cross-linking), blending, washing, filling, and sterilisation. Among them, the mixing and reaction processes are the key steps that affect the mechanical properties of the final product. The manufacturing process, including modification with BDDE or reaction in basic condition, will alter the natural structure and properties of the hyaluronic acid. Therefore, the manufacturing process has to be optimised to achieve effective physicochemical properties and maintain the hyaluronic acid’s natural structure and properties. 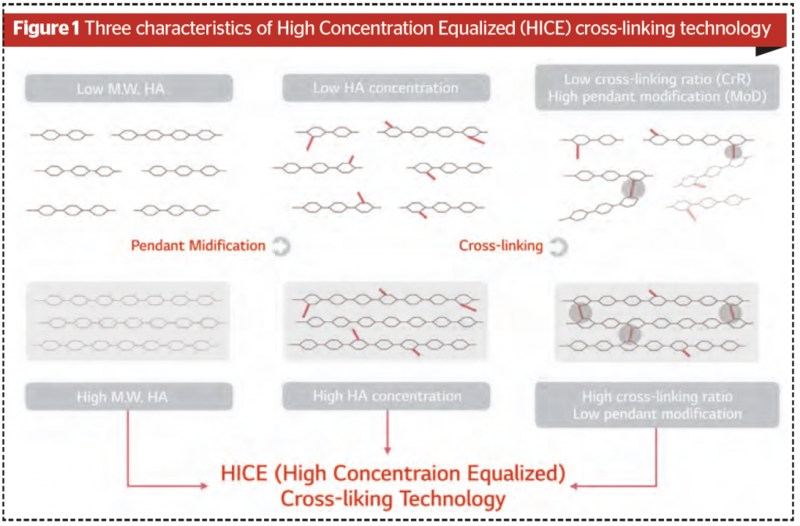 HIgh Concentration Equalized (HICE) cross-linking technology is adopted to manufacture the YVOIRE® series (Figure 1). HICE starts with the use of high molecular weight hyaluronic acid (3 MDa) which is produced by LG Chem’s bio-fermentation process (non-animal origin). Hyaluronic acid molecules can remain relatively intact even if they have been degraded under harsh conditions. However, high molecular weight hyaluronic acid is hard to handle, especially during mixing. Therefore, specialised instruments and controls are designed to mix the raw materials in maximum homogeneity. Thanks to the specialised mixing process, a highly concentrated mixture of hyaluronic acid can be prepared. If the distance between the hyaluronic acid molecules is short (high concentration), the probability of the molecules cross-linking with one another increases. Consequently, the pendant-type modification decreases while the cross-linking ratio increases (high cross linking ratio but low pendant modification). Therefore, higher mechanical properties, including storage modulus or complex viscosity, can be achieved compared to other competitors. 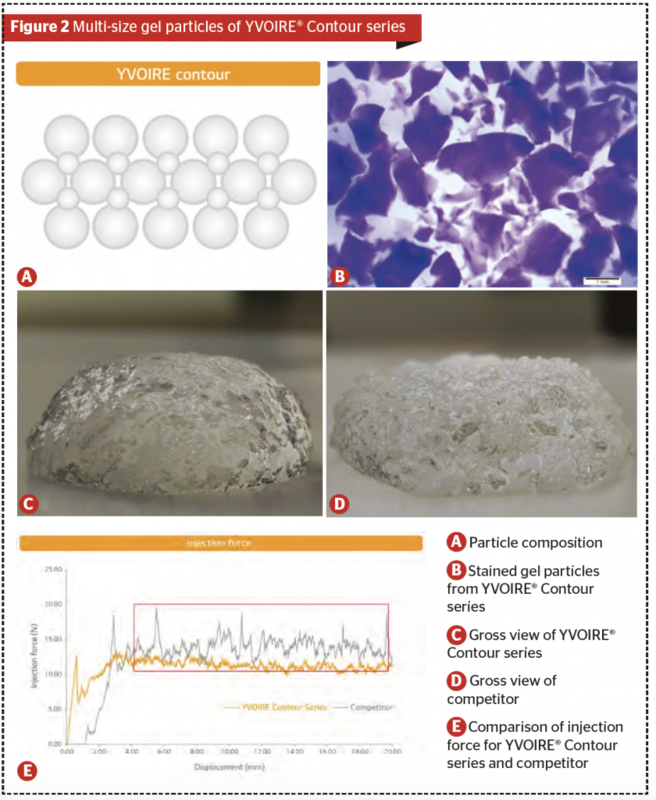 Contour series YVOIRE® Contour series (YVOIRE® Contour and YVOIRE® Contour Plus C) has the largest gel particles among the YVOIRE® series. The particles are so large that there are many voids and gaps between the particles. However, fine particles are mixed with the larger particles to fill in the voids and gaps so that they replicate a brick and mortar structure. The fine particles not only provide the gap-filling effect but also smoothen the surface of the gel (Figure 2). 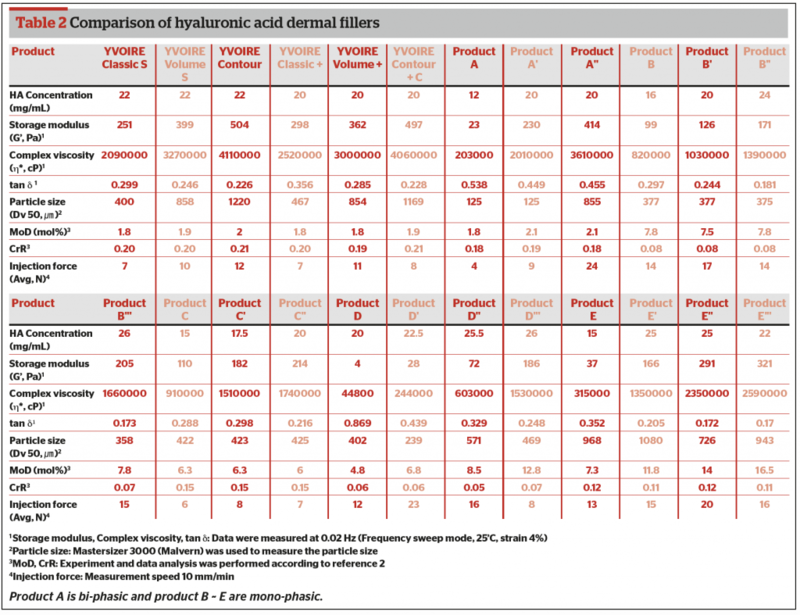 Common parameters to describe the hyaluronic acid dermal filler are explained below (Table 1). And several competitors were compared to the YVOIRE® series (Table 2). Most of the data were measured by using the rheometer, and the UTM (Universal Testing Machine) was used to measure the injection force. 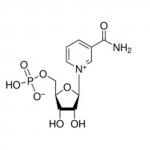 Also, modification degree (MoD) and cross-linking ratio (CrR) were calculated from 1H-NMR (Nuclear Magnetic Resonance) and LC-MS (Liquid chromatography Mass Spectrometry)2–4. The integration of cutting edge technology with non-stop manufacturing process creates the gorgeous YVOIRE® series. The hyaluronic acid raw material that is manufactured and controlled under the certificated facility secures the quality of the final product and the specialised product manufacturing process (HICE) makes it possible to produce the highly competitive hyaluronic acid dermal filler i.e. YVOIRE. LG Chem has studied hyaluronic acid products since 1990. LG Chem’s non-animal origin hyaluronic acid has been marketed in various medical fields since 1995. It launched solutions used for ophthalmic surgery in 1995, and a drug for osteoarthritis in 2005, using hyaluronic acid ingredients. Hyaluronic acid raw material has been listed on the Drug master file by the US FDA and certified by the European EDQM. And thanks to accumulated knowledge and HICE cross-linking technology, LG Chem acquired KFDA approval as the first Korean hyaluronic acid filler, ‘YVOIRE® Classic’. In year of 2014, the full product range YVOIRE® acquired the CE mark in Europe as well as CFDA approval in China. As of 2019 April, the brand is being marketed in 30 countries around the world. LG aesthetics, aesthetic business in LG Chem, will continuously expand its technology and look to broader aesthetic business areas to satisfy worldwide doctors and patients.